Apple’s truly wireless design is one of the best features of its AirPods earphones… most of the time. It’s great to be able to pop them in your ears and not have to mess with a cable, and sliding them into the included charging case is very convenient. But what happens when you work out? The smooth plastic Apple used on the AirPods is terrible for keeping them secure in your ears, and that’s especially true when you’re sweating. The VIMVIP AirPods Strap with Magnetic Closure is the perfect solution, and we wish Apple had included it in the box with AirPods. That way they’re truly wireless when you’re looking for convenience, or you can attach a simple neck strap when you need them to be secure. Magnetic Function: It is a newest upgraded version design for anti-lost your airpods – Magnetic Adsorption. Added magentic suction function inside the strap hole,it can adsored and fixed firmly at neck to againt sliding down when you do not use it, you will feel comfortable whatever you are doing sport,walking or sitting in car. Skin Care: Adopted findest soft silica gel to make of, and it becomes more softer after machining by excellent hand painting technique and artistry.It is so soft that you don’t worry about skin irritation in Long-term wearing. Tensile Resistance: Used high quality and flexible wire with a high tensile strength, not easy break. Superior design features enable a much longer service life than competitive Product. 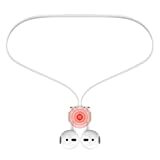 Easy to Wear: With the advantages of beauty, lightness and rational design concepts, this apple airpods strap is very easy to use, you just put your airpods in the hole of this airpods strap and you can wear it firmly. Never lost your airpods. What You Get: VIMVIP Magentic Apple AirPods Strap and our 12 months warranty and friendly service for you.